Cowgirls Take Down #5 Augusta! The Abilene High School basketball teams split at Augusta Friday night. The Cowgirls won 45-43 in overtime to improve to 3-0 on the season. The Lady Orioles entered the game ranked #5 in 4A by the KBCA. They returned three players from their state team from a season ago. The Cowboys suffered their first loss of the season 68-55 in the second game of the night. The Cowgirls got a huge game from Senior, Sydney Burton in the victory. She finished with 21 points, shot 12-14 at the foul line and scored the final 10 points of the game for her team. The Cowgirls led by as many as 12 points in the third quarter on two occasions but watched their lead evaporate in the fourth. Augusta Senior, Kourtney Divine hit a three-pointer with 1:02 left in the game to give the Lady Orioles their first lead since early in the second quarter. She then added two free throws to push the lead to 40-36 with just :43 seconds left. Burton would then get to the line twice and hit all four of her free throws, her last pair of free throws tied the game at 40 with 17 seconds left in regulation. In overtime Augusta jumped out to a 43-40 lead but Burton would answer. She converted on a three point play to tie the game with 1:27 to play in overtime and then scored with just 19 seconds left to give her team the two point lead. 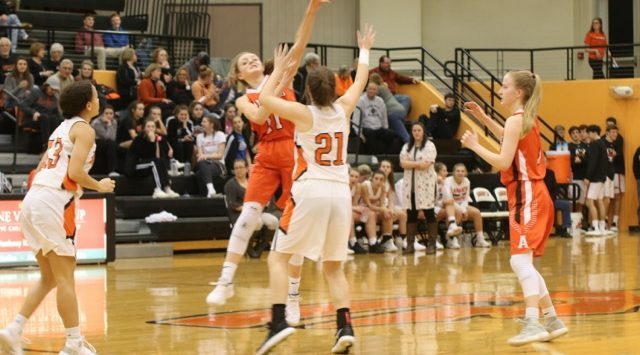 Abilene started slow in the game, the Cowgirls trailed 13-9 at the end of the first quarter, but outscored Augusta 14-1 in the second to take a 23-14 advantage into halftime. The Lady Orioles closed the gap to six at 30-24 at the end of the third quarter. The Cowgirls also got double figures from Senior, Hannah Willey, who finished the night with 16 points. In the second game of the night, the Abilene Cowboys surrendered a 14-0 run to the Orioles in the late first and early second quarter and never recovered. Augusta led 13-9 after one quarter, 33-19 at halftime and 53-17 after three quarters. Abilene fell behind by as many as 19 points in the final quarter. The Cowboys got to within 9 points but couldn’t get any closer. Abilene did get a career high 24 points from Senior, Tim Barbieri. The Cowboys also got double figures from Senior, Preston Boyd 12 and Junior, Travis Beetch 11. Abilene will travel to Concordia next Friday. The Cowgirls split with the Lady Panthers last season while the Cowboys swept Concordia a season ago.